One of my most prize possessions in my closet is my beloved leopard boots! They are not only comfortable but so fashionable with a variety of outfits. 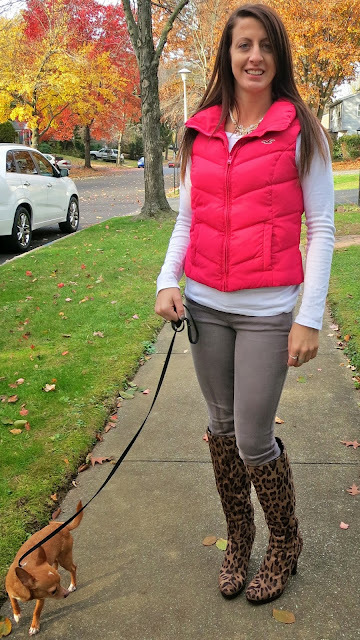 In this post I dressed them down with a simple white shirt and a pink puffy vest. But in this post I dressed them up a bit with some dark wash skinny jeans and a slim fitting open knit sweater. So by wearing them two ways I get the most out of these beloved boots. I can wear them for a simple walk with my dogs or I can wear them before I head out for the evening with friends! Win $50 gift card on Wizards of the West! ! You definitely make those stunning boots very practical! Aww why thank you Rachel!!! Thanks Lauren it's so much fun being a part of this!! I don't think I've ever seen knee high leopard boots before, they are so cute! i know right and they are SO versatile!!! Oh my leopard print boots, those are hot! Thanks Alicia, they are my fav! I love anything leopard! These boots are so cute!